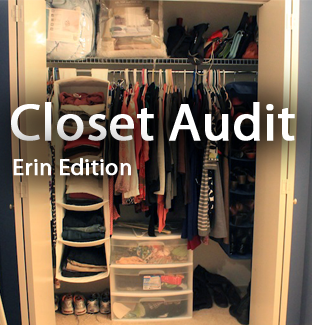 If you haven’t audited your closet in a few years, I suggest you find some time and make it happen. It usually takes me about five hours, beginning to end. It’s cleansing for the soul! 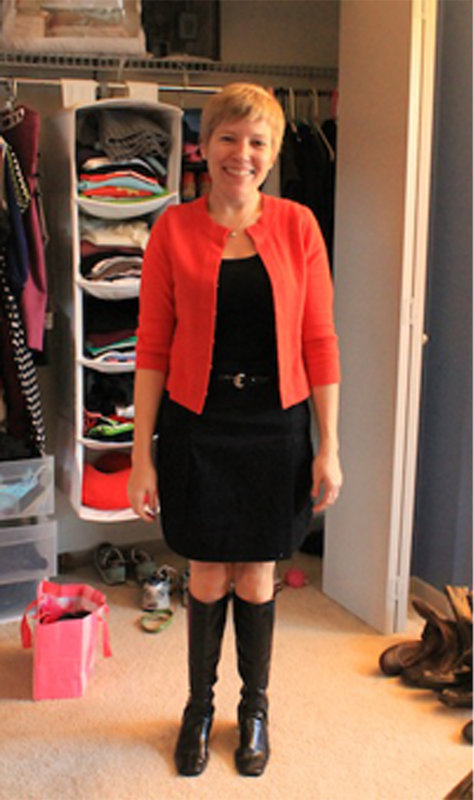 I think that Erin’s closet is perfect for this post because she has Classic American Closet Challenges – a little tight on space, great items are hidden amongst the rifraf, and the slight feeling of malaise that comes from seeing the same stuff put together the same way too many times. 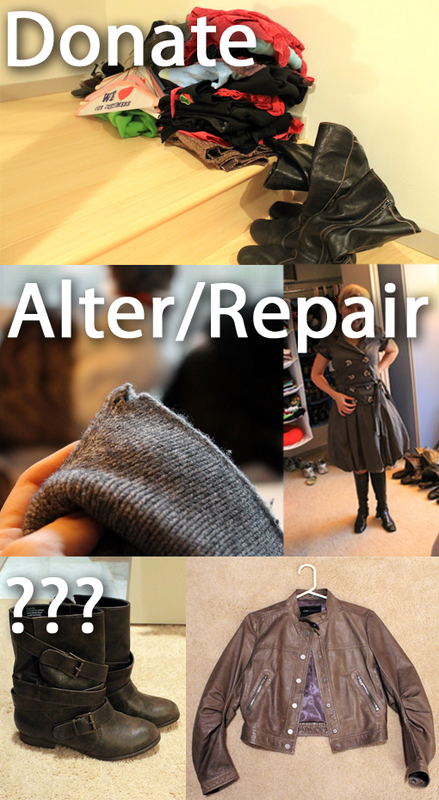 We pull everything out of the closet and sort it by type. This part should move quickly – don’t agonize over which category an item belongs in – we’ll get to everything eventually. 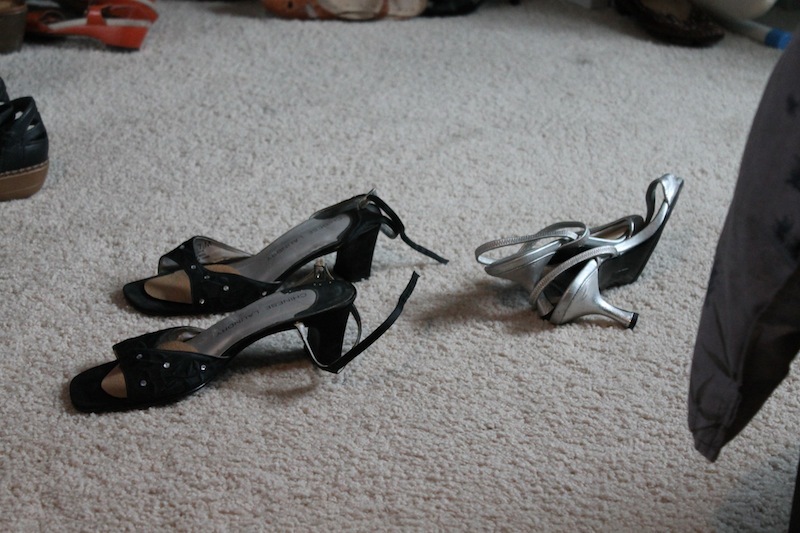 Shoes: Day, Evening, Athletic. Sub-sorted by color. Immediately discard items that you already know you hate. We hate you now, because you rub us wrong. Create three piles: Donate, Alter, and ??? The ??? pile is where you put clothes that you love, but can’t figure out how to wear. Try everything on. You might want to wear a tank top and boy shorts so that it’s easy to get changed. That pair of pants she thought she hated were actually great when paired with the right shoes (which happen to be the red patent cuties above). Erin had a ton of great stuff that just happened to be about six inches too long. Once she gets those dresses and skirts hemmed, she’s going to have a whole new bag of tricks to pull from her closet. 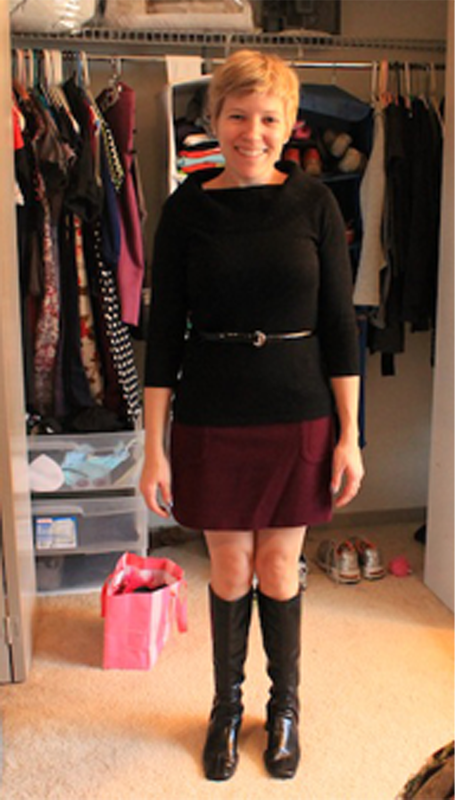 All that black skirt needed was a belt. There are three items in the ??? category, and we didn’t have time to tackle them during this visit. So once Erin gets her tailoring done, I’m coming back, and we will figure out how to get that leather jacket, plum strapless number, and those boots into rotation. It will be fodder for a future post. The belt inspired a whole conversation about "finishing pieces"
OMG! Love the two outfits! I don’t remember auditing my closet. But I do remember cleaning it out BECAUSE of you. Several times. And the fight with Eric over his! Ah, boys. So inspirational! My closet is running over with things I haven’t touched in so long! I love this idea! Lynnea, is there anything that you can do with those pieces that you are sentimental about? It doesn’t honor any memories by having to cram things in your closet (having not seen your closet, I admit that I don’t know if you do that). But could you make a t-shirt quilt? Modify an item so that it better fits your life now? 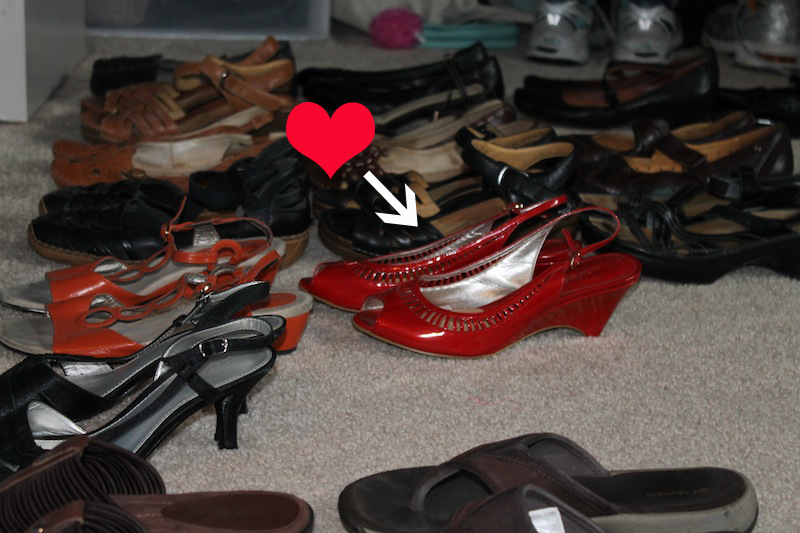 Do a photo essay on a favorite item and write about why it’s important so that you are liberated to give it to someone else who will actually wear it? Pack it away so that you have room in your closet for stuff you actively wear? Everything that you have in your home should serve and fulfill you – is your sentimental item doing everything it can for you in its current state?